This post has been read 756 times! Update December 16, 2018- This Broadway show is now over but Netflix is streaming a filmed version of it. Seeing it for a second time confirmed my thoughts. Bruce recites from memory two-and-a-half hours of dialogue and music, and he does it without any memory lapses. The timing of the jokes is the same and he gets the same laughs, etc. It is amazing. 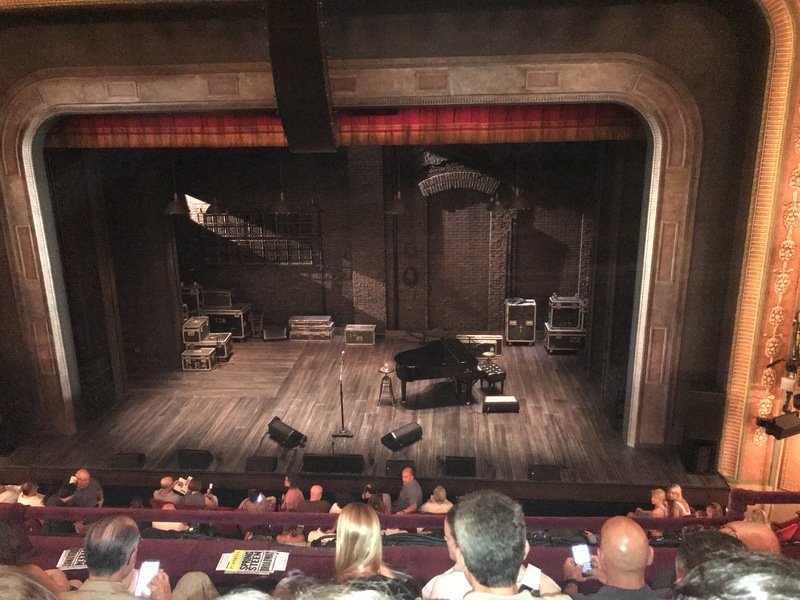 Last night, I saw the Bruce Springsteen on Broadway show at the Walter Kerr theater on 48th street. It was one of those rare shows that exceeds the hype. I started out in a bad mood. Ticketmaster is such a horrible company. Not only did they screw up the lottery process for getting tickets, but when I finally was able to purchase a ticket, the floor seating chart was confusing and I bought upstairs mezzanine seats when I though I was buying near-front-row downstairs seats. Fortunately, the theater is small and the view was good. However, the greedy theater owners have crammed together the rows so much, like the airlines, that I was very uncomfortable. My knees were bumping into the seats in front of me, and I am not an unusually tall person (There needs to be more negative press on this seating scam that plagues Broadway). The show began with Bruce walking out to a barren stage, no set design, just two stools, a guitar, and a piano. It was very much like David Byrne and The Talking Heads’ design to their Stop Making Sense tour in Broadway theaters. Throughout the show, Bruce spends about 50% of the time telling stories and 50% of the time playing acoustical versions of his songs. His set list consists mostly of songs that were recorded as solo acoustical guitars, such as The Ghost of Tom Joad or Nebraska. Bruce looks and sounds like a healthy 40-year-old. The music will not disappoint you. The stories he tells are taken from his autobiography that came out in the Fall of 2016. I was not a fan of Springsteen until I read that. In my high school days, Born in the USA was popular, along with the other artists of the pop movement, such as Michael Jackson, Madonna, Prince, etc. Therefore, I had labeled Bruce as an insincere pop artist, unlike my other more serious favorite bands. But as I purchased Springsteen albums, particularly the ones after he got a new producer in the 20o0’s, I started to really enjoy Springsteen’s works. As the show progressed, it soon became apparent that Bruce was not reciting a script. Some of the dialogue is identical from previous shows, but much of it is improvised too. Every new joke he told was a home run. There was not a single moment where his monologue seemed to be failing. Bruce was one with the audience. Then, it occurred to me. Rock and Roll stars truly are the most powerful entertainers that the world has ever seen. Without much effort at all, Springsteen converted an autobiography into the hottest ticket in town, and all he does is talk to people. This is child’s play compared to playing before more than 100,000 in Hyde Park, London, or Giants Stadium in New Jersey. If Bruce were a mere actor doing this same show, he would need a script. He would be an empty vessel into which words are poured by others. He would be a fake act. But when you see this show, you are observing a real man play a real instrument, telling stories about his real life. Bruce needs no script. He writes the script. It is in his head. He writes the music. You are watching the nidus of it all on stage. While the show is entertainment like a fictional Broadway play, it is also 100% genuine. I cannot think of another example like it. It is a completely new genre apart and above from fake plays. Theatergoers get the awesome musical talent of a man who has entertained large stadiums for 40-years. They also get the autobiographical story telling of the man who writes the lyrics. The “magic trick”, as he calls it, works. It makes the audience lower their cynical guard. Whenever I am at a Roger Waters concert, or some other liberal show or venue, I monitor the audience for signs of people disagreeing with the leftist propaganda. Even here, in liberal Manhattan at a Bruce Springsteen concert, I would say that about half of the audience sat quietly as the vocal fascists applauded. There is a silent majority. But back to the show, Bruce went on to complete the planned act. However, he must have been refreshed from the holiday and liked our audience so much that he gave us, “The first ever encore” because we were, “such a good audience” (Which, I confirmed to be true. It was the first time he came back for an encore.). Before the show started, I gave a valuable extra ticket to a theater manager to hand out as he saw fit. A lady sat next to me using that ticket and I said nothing. After the show, I smiled and asked, “Did you like the show?” and told her it was my ticket. It was like being Santa Claus. This entry was posted in Events and Activities, Film Theater and TV, Life Lesson Essays, Music and The Arts Essays, Music Bands, Nightlife, Op-Ed, Performing arts, Propaganda, Hollywood, and News Essays, Reviews. Bookmark the permalink.